released books. Some of the books aren’t on the shelves yet! Quiet Strength, CD by Russel Blake is available on iTunes, Rhapsody, and Amazon.com MP3 Downloads. Play This, CD by June Rochelle is available on CD Baby, iTunes, Rhapsody, and Amazon.com MP3 Downloads. Nearly everyone would agree that music is one of the most significant and enduring art forms ever created by mankind, though most people still view it primarily as entertainment. An astute few seem capable of looking beyond music’s obvious entertainment value, and among these is bassist Russel Blake. He views music as both a tool for healing the spirit, and as a means of removing the cultural barriers which divide us, by serving as mankind’s universal language. Blake strives to convey this message not only through his music, but also through his words and actions. To Russel Blake, being a musician is a gift which carries with it a serious obligation. June Rochelle kicked off 2008 in a big way by releasing her new CD “Play This” and gaining the attention of President elect Barack Obama’s Campaign for Change where she was the headliner for one of their events in the state of Indiana that went from red to blue. Hollywood star Sanaa Lathan used her star power to plug the event in Indianapolis and the rest is of course history. These words are meant to honor you because I understand, all the lessons you taught to me. To help me to become a man. Often look back into our past and I marvel at the years gone by. How time has had so little effect of the vision of me in your eyes. You’ve often had to navigate treacherous waves left in my wake. You’ve manned the bilge and held the line in hopes…I’d get it right this time. Life’s to short to throw away. With time and love and money too you’ve done your part to see me, through. The best things I’ve learned, I’ve learned from you. To you….I owe my existence my dreams. Like all great men you’ve overcame great things. As your blood and genes do flow in me I promise to make myself happy. And should my glow reflect on you…….I hope to make you happy too. Thank you father, this is to honor you. Jonathan Z. Queen, the oldest of five children, was raised in an impoverished neighborhood in Harrisburg, PA by a struggling, single mother. He began using and selling drugs at the age of 14. At the age of 23 he was arrested for the third time, labeled a Career-Criminal and sentenced to 10 years in a Federal Prison. During the last four years of his 9-year prison sentence, Jonathan completed over 18 months of criminal behavior and drug education programs. He subsequently volunteered for the 500-hour Residential Drug-Abuse Program, where he became a Peer Counselor, Sponsor and Board Member on the Education/Tutoring Committee. Jonathan graduated first in his RDAP class and has become well-versed in Rational Emotive Behavior Therapy (REBT), ABC’s of Rational Self Analysis, Criminal Thinking Errors, Anger Management, Conflict Resolution, Victim Impact and Assertive Communication. Today, Jonathan Z. Queen is an author, motivational speaker, playwright, actor, director, and poet. He is the co-founder of New Mindz Enterprises and Vice President of Asikari Publishing, LLC. He is a contributor to The Q Review and an editor/columnist for NY Gospel Magazine. He is an ordained deacon at First Baptist Church of Lexington, Va and works as a Government Contract Manager at Sayre Enterprises Inc. where he also directs the employee GED program. More importantly, he is a devoted husband, faithful father and community leader. He was recently featured in the Federal Prison Industry 2008 Annual Report to Congress in an article entitled The Power of One Success. Jonathan is also a member of The National Exhoodus Council (NEC); a nationwide campaign comprised of formerly incarcerated professionals; all are former members of the criminal/drug/gang culture who now manage community based organizations in 50 cities. Their motto is: Serving Our Country After Serving Our Time. Mr. Queen is a very energetic, effective and inspirational speaker who specializes in interactive workshops that include spoken word, improvisations and role playing. His experience as a GED Tutor in four different Correctional Institutions has made him very knowledgeable about the correlation between illiteracy and how the drop-out rate affects the crime rate; he especially enjoys sharing his experiences with at-risk-youth. 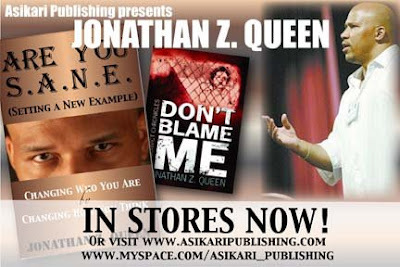 Jonathan Z Queen is the new example. If you missed some of the articles that came out in May, here are those jewels for you to explore at your leisure! Feel free to share the links with your list too. News: What lies in the souls of men? What lies in the souls of men? author and publisher, elissa gabrielle posed the question and powerful, prolific and passionate men exposed their souls. (Poconos, May 1, 2009) Passionate, Powerful and Prolific. The second book in the Triumph of My Soul series, The Soul of a Man takes a look into the hearts, minds and souls of men. From Elissa Gabrielle’s The Triumph of My Soul series, comes the second book in the series, titled, The Soul of A Man which promises to deliver powerful testimonies from some of today’s brightest male stars. From socio-economic barriers, to racial tensions, broken hearts, to new found faith-experience the plight of man, as only he can explain it, told from his perspective and from his heart. Through expressions of the history of his past, the reality of his present, and the optimism of his future, these gifted men relate what stirs a man’s soul and ignites his actions and his thinking. Men the world over have always been much maligned and strident ina how life portrays and prefaces their successes and failures. This collection of enlightening stories personifies the sentiment, faith, resilience and love embodied in the creation God made in His own image. The Soul of a Man is a Divine truth and an affirmation of the passion running through the minds of men where hearts and souls are bared. In continuation of the Triumph series, the second book, The Soul of a Man: A Triumph of My Soul Anthology, features these brilliant men; Joe Thomas, Jihad, William Fredrick Cooper, Alvin C. Romer, Marc Lacy, Maurice M. Gray, Jr., Brian Ganges, Jarold Imes, K.L. Belvin, Joey Pinkney, Thomas Ashburn, Jr., Clarence “Baba Simba” Mollock, Tyrell Floyd and Eddrick Dejuan. “Our men are so much more than what society feeds us. They are powerful, strong; they fear, they rejoice, they love, they care. Our men are much more than criminals, rapists, pimps, and drug dealers. They are fathers, sons, brothers, ministers, teachers, friends, and confidants who have a soul, have claimed victory over their circumstances and they have a story to tell,” say publisher of The Soul of a Man, Elissa Gabrielle. The Soul of a Man releases Father’s Day, June 21, 2009. More information can be found at www.TheSoulofaMan.net or www.PeaceInTheStormPublishing.com. Enjoy your stay at Akwaaba, Washington’s literary themed Bed and Breakfast at the heart of Washington’s treasured Dupont Circle. This 1890’s historic townhouse mansion is located within walking distance of the White House, and the many fine restaurants, and shops of Dupont Circle. Enjoy the exceptional location, and Victorian charm of the Washington DC location of the Akwaaba Bed and Breakfast family of Bed and Breakfast’s. Located in the heart of one of Washington’s best neighborhoods, Akwaaba Bed and Breakfast DC offers a choice of 8 guest-rooms; each uniquely decorated and tailored around African American authors and classic genres. Dupont Circle, offers visitors more than 80 restaurant choices, exquisite, boutique shopping, several excellent bookstores, movie theaters, hip night-clubs and the Improv comedy theater. From a romantic weekend, sightseeing tour of the Smithsonian’s, or the professional business trip, Akwaaba Bed and Breakfast DC can make your stay comfortable, convenient and memorable. Guests will find easy access to the National Mall, Smithsonian Museums and Monuments. The city’s Metro system is a short 10-minute walk, and additionally a major bus line passes directly in front of the home, taking you to the White House in less than 10 minutes. The business traveler will find quick access to Washington’s new Convention Center, MCI center, and conference hotels- the Hilton Towers, Marriott Wardman Park and Omni Shoreham. All are a short metro ride, or even walking distance as in the Hilton Towers. All guests, with the exception of apartment guests who have their own kitchen, are treated to a Southern hot cooked breakfast each morning, served 8am weekdays and 9am weekends in the bright formal dining room. Afternoons, the Inn offers light refreshments in the parlor. Guests are always invited to relax in the formal living room, or adjacent parlor. To find out more about Akwaaba’s DC retreat, please click here. Akwaaba Mansion (Brooklyn, NY), Akwaaba by the Sea (Cape May, NJ), Akwaaba at Buttonwood Manor (Cape May, NJ), Akwaaba D.C. (Washington, D.C.), and Akwaaba in the Bayou (New Orleans, LA) are a collection of upscale bed and breakfast inns owned and operated by husband and wife team Glenn Pogue and Monique Greenwood. Monique and Glenn fell in love with the idea of inns when they stayed at their first bed and breakfast back in the early ’90s. 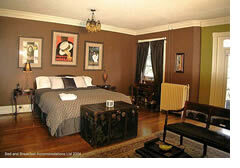 As guests, they enjoyed the hominess and comfort of the bed and breakfast experience. Monique quickly discovered that innkeeping combined all of her personal passions – architecture and interior decorating, entertaining and meeting new people, and helping others create wonderful, lasting memories. Read the entire story behind this fantastic collection of retreats. A tip sheet is a news release that offers advice or tips in a bulleted or numbered format. It’s one of the hardest working and most useful tactics available for generating publicity. Use a tip sheet to generate short column notes in a newspaper or magazine or to interest a reporter, editor or producer in a feature article or talk show interview on the tip sheet topic. Use a press release format. The biggest difference between a tip sheet and a traditional press release is that the body of the tip sheet will include your tips or advice in a numbered or bulleted format. As any health club owner knows, “taking better care of myself” tops New Year’s resolution lists each year. Yet, many people – particularly women – don’t know exactly what it means to take better care of themselves. • Make an appointment with a registered dietitian (RD) for a nutritional checkup. Call the American Dietetic Association at 800-366-1655 to locate an RD near you. • Switch your thinking from “ideal” weight to “healthy” weight. Remember, you are unique. Your healthy weight may differ from your neighbor’s – even if she is your height and age – because of other variables such as genetics, fitness level and overall health. • Look for “aerobic opportunities” every day. Park farther out in the lot at the mall. Take a brief walk at lunch or dinner. Think of the stairs as your friend. The American Dietetic Association Guide to Women’s Nutrition for Healthy Living, published by Perigee Books, is available in bookstores nationwide for $14. Book proceeds benefit nutrition research by the ADA, a national organization of 70,000 nutrition professionals, 98 percent of whom are women. Look for ways to include tip sheets in your publicity plan; you’ll soon see how easily they generate results. Sandra Beckwith, the author of Streetwise Complete Publicity Plans: How to Create Publicity That Will Spark Media Exposure and Excitement, teaches the online “Book Buzz” class for Freelance Success. Learn more at www.sandrabeckwith.com.